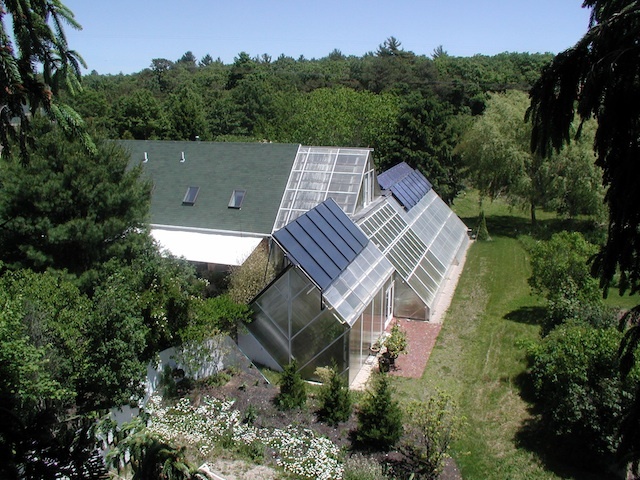 The Cape Cod Ark was built to see if it is possible to grow food in the Northeastern United States’ climate through the winter in a greenhouse, without using on fossil fuels or pesticides. It also was conceived to test whether fish ponds inside a greenhouse would improve the food yields of both the ponds and the greenhouse. Research and experience over several decades proves that yes, all these things are possible in a cold climate. And better yet, such a warm, plant-filled environment is a remarkably pleasant living space when attached to a home. The Prince Edward Island Ark tested the bioshelter concept in a very cold climate, and was the first bioshelter with built-in residential housing. A colder climate required more intense collection and storage of solar energy, using solar ponds, active hot water collectors and active hot air collectors. 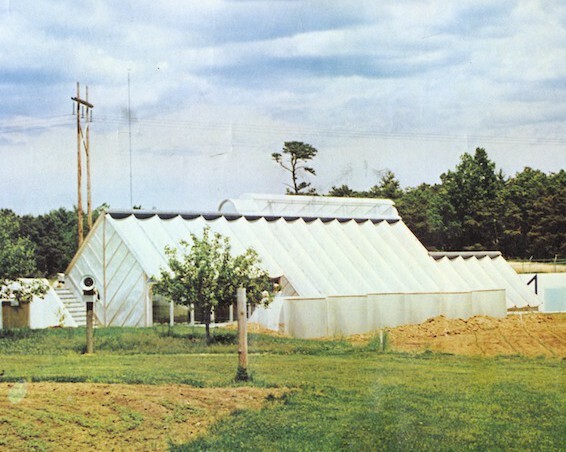 Funded and managed by the PEI government, the Ark served both as a research building for agriculture and aquaculture and an educational facility for the public. When the PEI Ark was built, the only eco-toilet available that would conserve water and recover nutrients was the Clivus Multrum. Since then, composting toilets have evolved and improved. See our section on eco-toilets for more information. A public exhibition, website and book explores the PEI Ark as a symbol of the emergence of ecological architecture and social change for sustainability on Prince Edward Island in the 1970s. From October 22, 2016 to April 30, 2017 a 40 year anniversary retrospective of the Ark will be on display at the Confederation Center for the Arts in Charlottetown, PEI. The exhibition is designed to travel to design-oriented and public art galleries across Canada, accompanied by a colour-illustrated 100-page book, published by Dalhousie Architectural Press. For more information, visit peiark.com.